Fattoria di Cavaglioni v Siena, Itálie: Zarezervujte nyní! NOTE! BUS SERVICE: on the Sundays and Holidays there are 3 rides to go to Siena and 3 to come back. When possible we can try to arrange a private transfers for 15 euros (for this is necessary that you contact us in advance one-two days) or regular taxi run all the time at 23 euro. Please advise about arrival time and if you wish one big bed or 2 separate beds! The perfect place to choose if you want to enjoy Siena without missing the best part of Tuscany: its beautiful countryside! 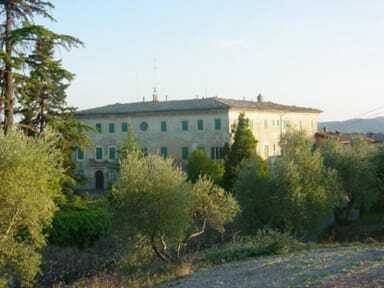 Fattoria di Cavaglioni is a 220 hectares farm only 10 minutes by car from Siena, 25 minutes by bus with the bus stop just in front of the accommodation. Sometimes we can also organize a private transfer for you at only 15 euros but this must be organized ahead time 1-2 days before your arrival. Or taxi cost 23 euros. 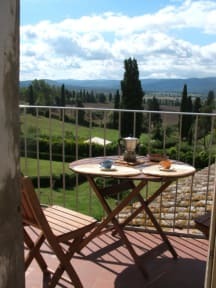 The bedrooms are located in the main building of the farm, an ancient fortress of the 15th century, or in the typical tuscan farmhouses at few meters. Good breakfast is served in the morning INCLUDED in the price! The fortress became a luxurious Villa in the 18th Century and, together with the farmhouses it overlooks the green beautiful valley of our Farm. You will have a kitchen at your disposition to cook your meals, free wi-fi, a pretty little pool (open from JUne 1st to October 15th) to suntan and looking at the wonderful landscape. There are huge green areas that our guests can use for walks or relax or bbq. The B&B is within walking distance with a pretty typical town (at 50mt) with shops, restaurants, bakeries, supermarket. We rent bikes, there is a ping pong and a BBQ at your disposition, with outdoor tables and lounge chairs. Since 1881 Cavaglioni has been owned by our family and the Villa still preserves intact the original furniture and paintings. You can easily visit Siena and we can organize your wine or sight-seeing tours to Montalcino, San Gimignano, San Galgano, Volterra, Pienza, Montepulciano, Chianti..
Or we can book you in activities like cooking class, horse-back riding and more. In our Farms we produce a great red wine and extra-virgin olive oil that you can taste and purchase. We speak perfect English and French and are happy to welcome and help all travelers. THERE IS NOT 24 HOURS RECEPTION, but we try to help you with your needs as more as we can. When we are not around you can still call us. We also rent self-catering apartments for 2, 4, 6 or 8 people for short or long term, located near the Villa, all of them with fireplace. Weekly rentals are very convenient.